Minnesota law requires a readily accessible U.S. Coast Guard approved life jacket for every person on waterfowl boats. For boats 16 feet and longer, there must be one U.S. Coast Guard approved flotation seat cushion on board, to throw to someone in distress. Seat cushions are no longer approved as primary flotation devices. Everyone on the boat needs a wearable life jacket of the proper size and type. Wear a life jacket - 10 lives could be saved in Minnesota each year by wearing life jackets. Avoid alcohol. Booze and boating don't mix. Hunt with a companion or group, staying within visual or voice contact. Boating safety increases with numbers. File a float plan. Leave it with a friend or relative. Include a description of your boat and equipment, names of passengers, planned destination and route, expected return and when and who to call if overdue. Keep an eye on the sky. No boater should ever start out in a storm. Check the forecast before heading out on the water. Be prepared by acquainting yourself with the area. Carry a cell phone or radio for emergency communication, but keep in mind you may not have service in a remote area. Make sure the boat has enough fuel. No boater wants to be stranded on the water. Prevent capsizing. Reduce speed in rough water, load carefully, secure loads from shifting and adjust for changing conditions. Wait for poor weather to improve. Prevent falls overboard. Remain seated while underway, wear non-skid foot wear and avoid reaching overboard for objects. Take a boater safety course and receive a boater education certificate. 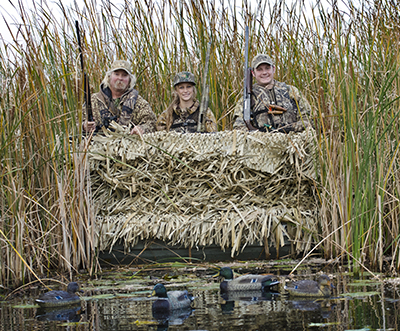 Download Water Safety for Duck Hunters, a free publication about waterfowl hunting boat safety.